The Think Tank was invited by Canadian artist and curator Michael Davidge to contribute a project to “Nova Express,” an exhibition which happened this weekend during Nuit Blanche Ottawa + Gatineau 2013. Our project, Radical Orations on the Structures of Support from Steinbeck, Washington, and Graeber, revisited the format of an earlier work as a way to distribute publicly performed orations of diverse texts that explore aspects of support, community, education, and power. The texts we’ve pulled include excerpts from John Steinbeck’s Grapes of Wrath, Booker T. Washington’s autobiography Up from Slavery, and David Graeber’s recent essay on the possibility revolution. Public oration draws on histories as diverse as street corner soapboxes, acts of public resistance, and the invocations of self-taught religious leaders. Great orators exert a magnetic force with little more than the resonance of their voices and the gestures of their bodies. 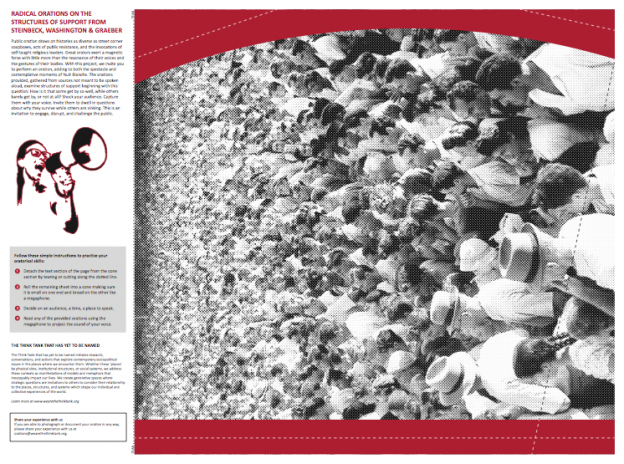 With this project, we created mass-produced newspaper insert which would invite Ottawans attending the festival to perform an oration, thus adding to both the spectacle and contemplative moments of Nuit Blanche. The orations provided, gathered from sources not meant to be spoken aloud, continue our examination of the structures of support — and begin with this question: How is it that some get by so well, while others barely get by, or not at all? 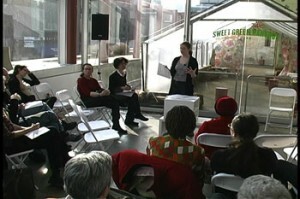 To read more about this project, check out a brief interview we did with Apt613, an Ottawa arts and culture blog. To download a copy of the publication, click here. This entry was posted in Notes and tagged conversation, performance, public art, structures_of_support on September 22, 2013 by admin. The Insurmountable Dilemma of a Rooted Practice was a presentation and performance developed for the Artivistic 2007 conference in Montreal, Canada. 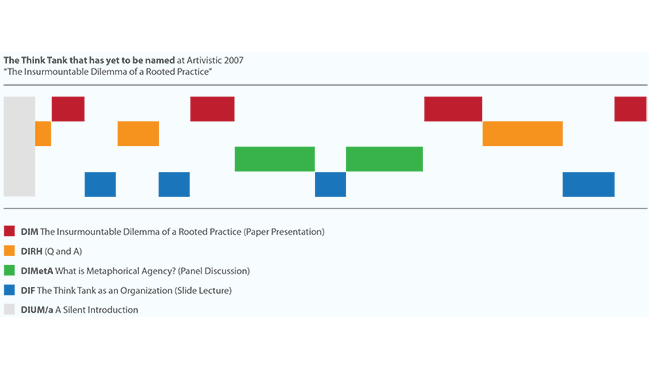 The presentation focused on and problematized the insurmountable dilemma inherent in exporting a deeply rooted and contextualized art and activist practice to a foreign location. Participating in the project were Meredith Warner, Jeremy Beaudry, Jethro Heiko, and Aaron Hughes. 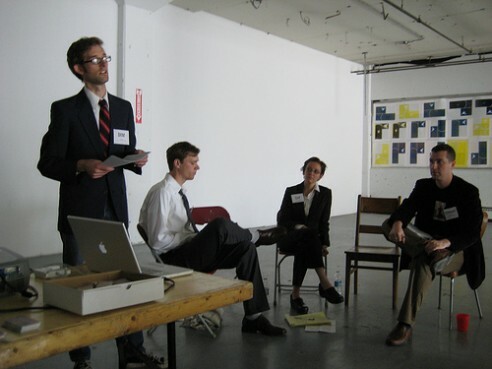 As part of Artivistic 2007 in Montreal, we presented a collaborative montage of typical conference presentation formats in order to interrogate a potential failure in our work. We have described this failure as the Insurmountable Dilemma of a Rooted Practice. For the conference, we performed a presentation about our work in order to problematize the insurmountable dilemma inherent in exporting to another locale a deeply contextualized art and activist practice. Specifically, we focused on our Publicly Held Private Meetings (PHPM). These are performative and collaborative interventions, and a format that we have used frequently in our investigations of contemporary urban issues in Philadelphia. As a critical spatial practice, PHPM’s are held in the places directly related to the focus of the given investigation, even while considering and comparing its situations to other cities. Living, working, and organizing in Philadelphia, we rely on an intimate knowledge of the city in order to initiate and facilitate these dialogical projects. This knowledge is often gained over time through research, observation, and by virtue of simply sharing and negotiating space with others. Traveling to another place to “make work,” prior to this experience, fell outside of the practice of the Think Tank that has yet to be named. 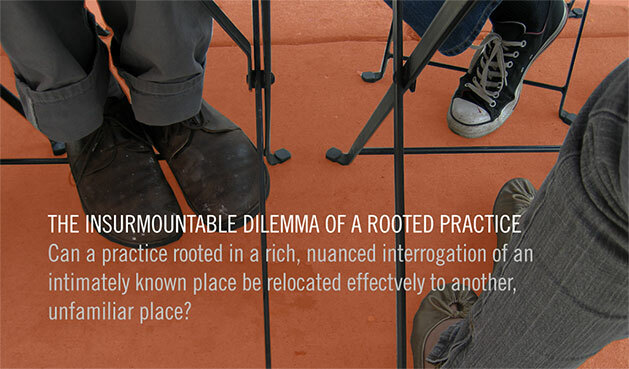 A number of questions were raised for us that are relevant to the conference thematic: Can a practice rooted in a rich, nuanced interrogation of an intimately known place be relocated effectively to another, unfamiliar place? To what extent does such a localized art / activist practice rely on internalized assumptions about the valorization of indigenousness and the privileging of “authentic” spatial occupation? And what is “authentic” spatial occupation anyway? Can we even precisely locate indigenous? This entry was posted in Projects and tagged art, community, performance on October 29, 2007 by admin.